As the mom of a very active toddler, I’m a big fan of outdoor play – whether it’s at the water table in the backyard, raking leaves or gardening together, or taking walks to the park. During winter months it’s not always possible to get outside for long periods of time, and that can lead to some pent up energy. 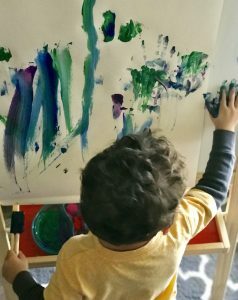 On those days, indoor sensory play and creative art activities can provide opportunities for quiet, focused play even for active kiddos. This activity is super easy to set up and can give you a good 30-40 minutes of play. We use this easel from Ikea, which takes standard rolls of easel paper. Set it up near a window to provide maximum natural light, which creates an optimum working environment, especially if it’s gloomy and rainy outside! The best part of fingerpainting is it’s so completely washable that we don’t even bother with smocks or tarps. You could use them if you prefer, but this paint washes out of all the kids’ clothing, and for cleanup, a microfiber rag with a little bit of soap and water will get everything up in seconds. Start with a little bit of paint in each color, and refill as they run out. The same goes with the paper… this session produced 4 completed paintings! As each one was completed, we cut the paper and rolled out some more. When the play is over and it’s time to clean up, involve the child in cleanup if you can! 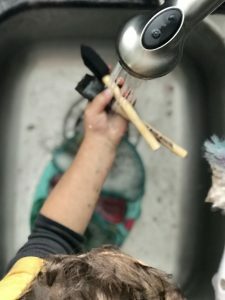 Pull up a chair or stepladder to the sink and help with hand washing, and then allow the child to wash out their brushes and the paint tray. 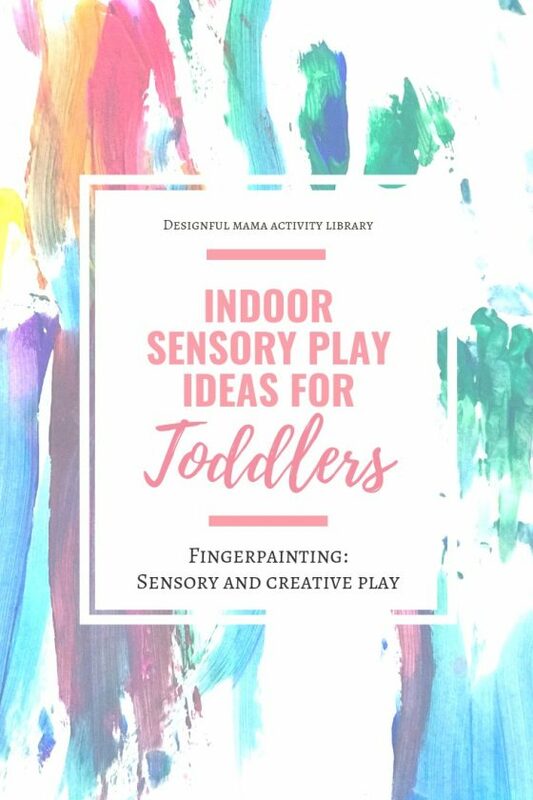 It’s a great way to extend their play with additional sensory activity, and it also gives them purposeful play, knowing they are doing something important. 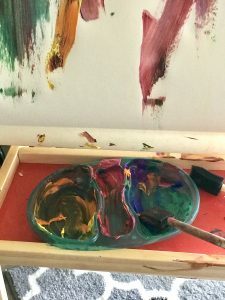 Allowing them to participate in clean up this way will also keep little hands busy while you wipe down the easel and the floor! Last, let your child choose a favorite to display on the wall. Their art gallery can be changed out as new favorites emerge, but they love knowing that their work is treasured, and they enjoy seeing their handiwork proudly displayed. By asking them to help choose a favorite, they learn there is value in their best work too!